According to an LA Times article, the City’s Planning and Land Use Committee unanimously declined this proposal as unsafe noting that other residences close to freeways have air filters, but backyards can’t have air filters. Harbor Gateway North Board Member Rosalie Preston is quoted about the result and fact that Councilmember Buscaino was silent on the project. Rosalie Preston, who sits on the Harbor Gateway North Neighborhood Council, said she was “ecstatic” with the committee’s decision to reject the proposal. But she voiced unhappiness with Buscaino, who sits on the board of the South Coast Air Quality Management District, an agency that frequently objects to freeway-close developments, on the grounds that they would expose occupants to toxic exhaust gases and other harmful pollutants. 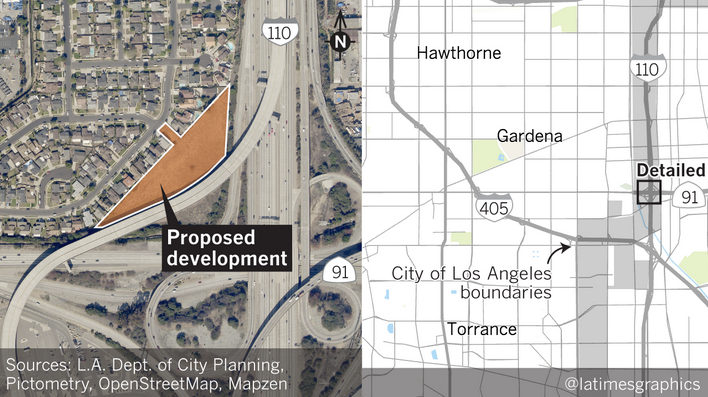 Developer Ali Awad proposed to build 24 houses in a vacant space at the northeast corner of the 110 & 91 freeway interchange five years ago. When his proposal was declined, he restructured his proposal to include 15 houses. Neighbors are concerned about the health hazards, noise and traffic for that project. Others say the health hazards and noise are the same as for everyone else in Harbor Gateway. They further point to the proximity of Da Vinci developments to freeways downtown. The developer proposes to minimize windows facing the freeway and to include air conditioning systems with high performing air filters. Harbor Gateway Board Member Rosalie Preston expressed concerns that residents will be at risk for pollution when they are out in their yards. The developer appealed the most recent decision by the planning commission.